Saddler, Hiram M 23 Allegeheny Co., Homestead Oct 15, 1895 Elizabeth PA X 116153810 Per ACWRD, On 9/5/1861 he mustered into "M" Co.; he was Mustered Out on 9/5/1864; other Information: died 10/15/1895 in Elizabeth, PA; "teamster"
Saddler, Philip M 20 24-Dec-1926 E. McKeesport PA Not found On 9/5/1861 he mustered into "M" Co.
Samm, Frank B 23 dark 5' 8 1/4" brown brown carriage maker Germany Not found Deserted 6-22-65 at Tennelytown, D.C.
Sampson, John C. F 18 farmer X Wilmington Twp, Lawrence Co. PA Aug 13, 1843 June 18, 1862 Hilton Head-Typhoid SC not found Buried at Columbia SC; per ACWRD, birth info. He was discharged on 5/30/1865. Sayer, Abraham D 18 5' 11/2" blue brown laborer Pa. 31-Jul-1916 Grand Rapids MI not found Or "Sager"; wounded June 17, 1864. Scott, John D Columbiana Co., OH 1840 Oct 17, 1897 Sacramento CA X 75799867 Died in CA in 1898 per ACWRD. Also "murdered" per ACWRD; findagrave info indicates Pvt. Scott died of a concussion. Scott, Robert D 20 dark 5' 9 1/2" grey black laborer Columbiana, New Waterford OH Pa. 27-Jul-1926 Columbiana OH not found On 2/27/1864 he mustered into "D" Co.
Seiford, Michael E 24 not found Per ACWRD, 1865 substitute mustered out with regiment--no other info available. Seigle, Jacob M 21 Allegeheny Co., Allegheny Germany April 16, 1841 15-Jun-1922 N.S. Pittsburgh PA Not found On 9/5/1861 he mustered into "M" Co.
Sellars, George W. M 23 Franklin Co., Antrim Twp, Greencastle 20-Feb-1918 Greencastle PA Not found On 2/22/1865 he was drafted into "M"
Sewall, Noah A. B 22 farmer W. Lach. Twp., Pa. Worth PA Mercer Co., PA May 18, 1839 5-Nov-1904 Mercer Co. PA Not found Discharged Aug. 31/64 on expiration of service; Per ACWRD is the following information: birth date/location, death date/location, wounded at Secessionville in thigh, wounded at Cold Harbor--amputated right arm at shoulder. 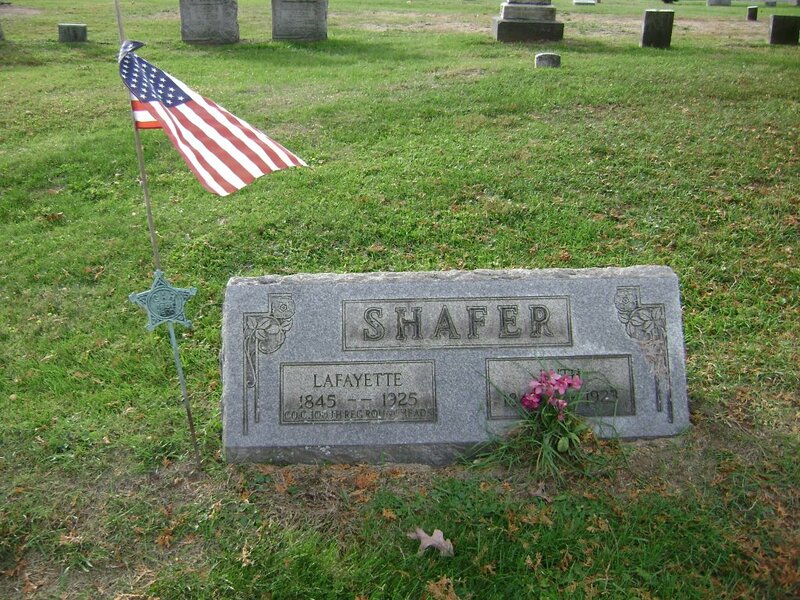 Shafer, Lafayette C 18 light 5' 5" blue light farmer Lawrence Co., New Castle PA Eastbrook, PA Dec 18, 1846 21-Oct-1925 New Wilmington PA X 18090235 Per ACWRD, birthdate and location. Shaffer, Jacob F 34 farmer Greenville, PA Mercer Co. Dec 15, 1825 Aug 4, 1891 Princeton PA not found buried in Center United Presbyterian Cem, Shenango Twp, Lawrence Co. PA; per ACWRD, sick on steamer "West Point" when it sunk in the Potomac River Aug 13, 1862. 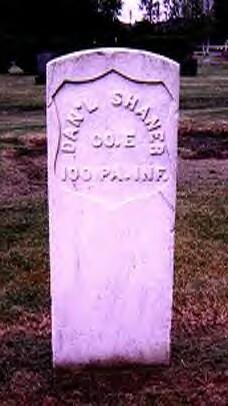 Shaffer, John C 24 May 27, 1865 Arlington Cem DC X 49312297 1864 Draftee; no other information per ACWRD. Shafner, John F 20 June 8, 1865 Washington DC X 49312318 Per ACWRD, 1865 draftee died 4 monthes later, buried in Arlington National Cemetery, VA.
Shambaugh, Alex H 19 Dec 1884 Not found Not listed in ACWRD; March 7, 1865 substitute; mustered out with regiment 7/24/1865. Shaner, Daniel E 19 dark 5' 9 1/2" black brown Yeoman X Lewis Co. Mossyrock WA penna. May 18, 1845 24-Jul-1926 Mossyrock WA X 16049663 X X CW Veterans Photo with Shaner holding the US Flag shot through hand and arm. ; per ACWRD, served 1 year with 15th PA National Guard. Shaner, Jesse B. E 24 tailor Chester Co. PA not found Per ACWRD, 1861 recruit deserted Jan 16, 1863--returned Sept 20, 1864. Sharp, John F 33 farmer Lawrence Co. PA June 18, 1828 14-Nov-1900 Dayton OH 1172298 ACWRD lists death as Nov 5, 1900, same as findagrave. Sharp, Luther M. F 18 light 5' 3" brown brown farmer Nov 7, 1864 Danville VA X 3268236 captured and died in prison; may have died October 31, 1864 with burial Nov 7, 1864. Sharp, William C 20 plasterer Beaver Co., Sharp PA 5-Jan-1902 Beaver Co. PA not found Discharged 9-6-1862; ACWRD has death as 1901 in Beaver Co.
Shaw, James N. E 23 Warren Co. Parthenia PA Scott Twp, Lawrence Co. PA March 2, 1841 19-Mar-1913 Warren Co PA 71173262 chronic diarrhea, hurt in James Island, SC when team ran away--left leg and ankle; per ACWRD, middle name "Newton"
Shaw, Marquis E 20 farmer Plaingrove, PA 1841 Feb 4, 1863 Philadelphia PA X 2547532 Per ACWRD, On 8/31/1861 he mustered into "E" Co.; died of diesease--fever. Shepherd, David A 46 Washington, Pa. not found No further record per ACWRD. Shepherd, George F 34 not found Per ACWRD, 1865 Recruit, deserted 5-29-1865--conflict, may have mustered out with regiment July 24, 1865. Shields, John G 19 Coitsville, OH Not found On 2/16/1864 he mustered into "G" Co.
Shields, Levi C 21 light 5' 5 1/2" grey light cooper Bradleytown, PA Feb 15, 1842 5-Mar-1913 Bradleytown PA 57821770 Wounded at Spottsylvania CH 5-12-1864; birth date and location; after war lived in Cooperstown, PA; findagrave info is likely match based on birth/death years. Shoaff, George S. H 22 Lawrence Co., Neshannock PA Neshannock Twp. PA Nov 7 1841 7-Oct-1925 New Castle PA 16055111 On 1/15/1864 he mustered into "H" Co.
Shultz, Frederick E 34 fair 5' 11" hazel dark laborer Germany Dec 18, 1892 Parkers Landing PA not found Per ACWRD, 1865 substitute and death location. 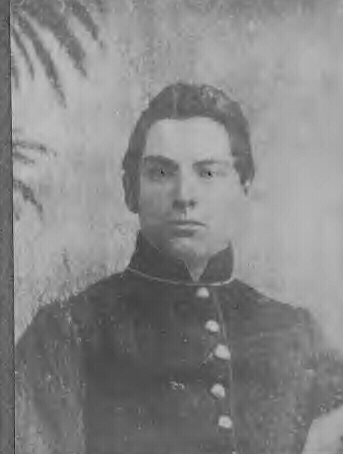 Shuman, Levi F 30 1907 not found Per ACWRD, 1865 Draftee. Shurlock, Robert J. D 27 lab. Lawrence Co. Irish Ripple PA April 5, 1835 13-May-1910 Newport PA 63009063 Birth date and burial locaion per ACWRD. Sickles, Robert H. M 18 Washington Co. Carroll not found On 9/5/1861 he mustered into "M" Co.
Siford, William F. H 19 21-Jul-07 Madera PA 31139861 On 1/30/1865 he mustered as a substitute into "H" Co; He was Mustered Out on 7/24/1865; Possible match on findagrave info listed as July 31, 1907 in Madera with middle initial "T". Silk, Henry C 18 laborer not found listed as wounded in Missississippi, wounded by explosion of gun date/location not stated per ACWRD. Simcox, Wm. S. A 22 1841 March 25, 1865 Petersburg VA 24293630 No other information found. Sloppy, Henry J. A 26 Clearfield Co., Knox PA Snyder Co., PA Aug 26, 1838 2-Mar-1918 New Millport PA X 68439815 Middle name "Jackson"
Smith, Jacob D 32 Butler Co. Summit 15-Oct-1901 not found 1865 Substitute; no other information available. Smith, James F 36 miner 1843 1922 Pulaski Twp, Lawrence Co. PA X 42840873 buried in Pulaski Cem. ; no other info available. 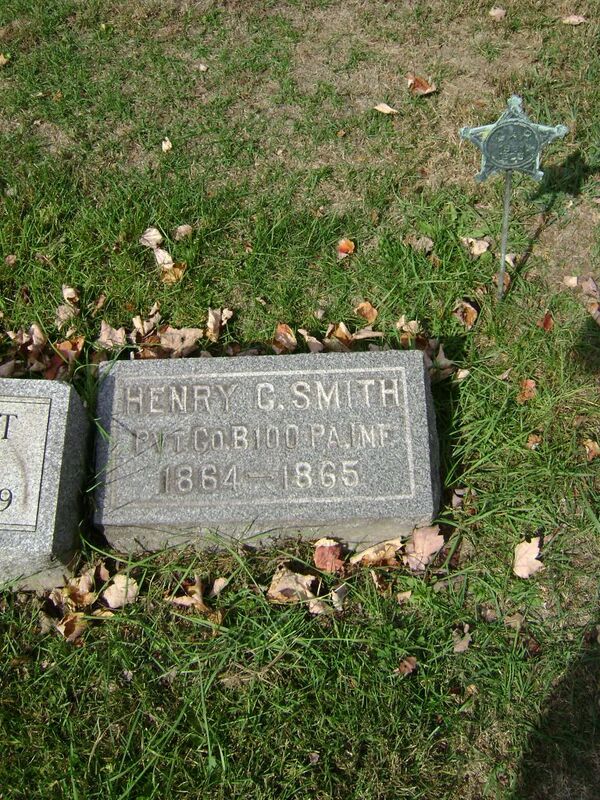 died 2/8/1912 in Soldiers And Sailors Home, Erie, PA; (Brother of Samuel Smith of 100th PA Infantry); middle name "Erastus". Smith, James M. K 17 Nov. 7, 1861 Hilton Head SC Not found On 8/31/1861 he mustered into "K" Co.
Smith, Lewis B. D 21 fair 5' 4" blue light blacksmith New York not found No other information available. 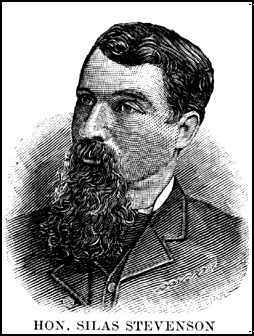 Smith, William F.L. D 23 dark 6' blue brown laborer Aug 19, 1864 Weldon Railroad VA not found Per ACWRD, his body was brought home; 1864 recruit. Snyder, Enoch G 22 Mercer Co. PA May 31, 1839 27-Jun-1905 Selma CA X 27990185 On 8/31/1861 he mustered into "G" Co.
Snyder, William M. D 20 5' 7" brown dark blacksmith Pa. Aug 7, 1864 Alexandria VA not found No other information available. Somers, William R. H 33 Aug 18, 1862 Charleston SC X 50713056 died as a prisoner from wounds rec. at Secessionville, June 16, 1862; ball lodged in knee, leg not amputated and ball not extracted, died of infection. On 8/31/1861 he mustered into "H" Co.
Sparks, John H 21 Edinburgh, Lawrence Co. PA October 20, 1842 July 4, 1864 Meade Station VA 54506230 On 2/24/1864 he mustered into "H" Co. ; He died on 7/4/1864; (Buried in National Cemetery, Meade Station, VA) buried in Nat Cem. Spear, Alexander C 17 florid 5' 8" hazel dark farmer Penna. July 30, 1864 Petersburg VA not found Killed at Battle of the Crater. No other infomration available. Spear, Peter E 21 21-Jan-1915 McCune KS not found Per ACWRD, 1865 draftee, no other info available. Spence, Augustus T. G 17 X Butler Co.; Forward 22-Mar-1919 Butler PA Not found On 1/31/1865 he mustered as a substitute into "G" Co. ; He was discharged on 6/27/1865; After the War he lived in Evans City, PA; "Spencer"? Spiker, James K 20 27-Oct-1913 Blackwood NJ X 41031741 On 8/31/1861 he mustered into "K" Co.
Spragg, Levi F. H 21 Sept 20, 1862 Nat Mil Asylum Cem DC X 35809853 On 8/31/1861 he mustered into "H" Co. 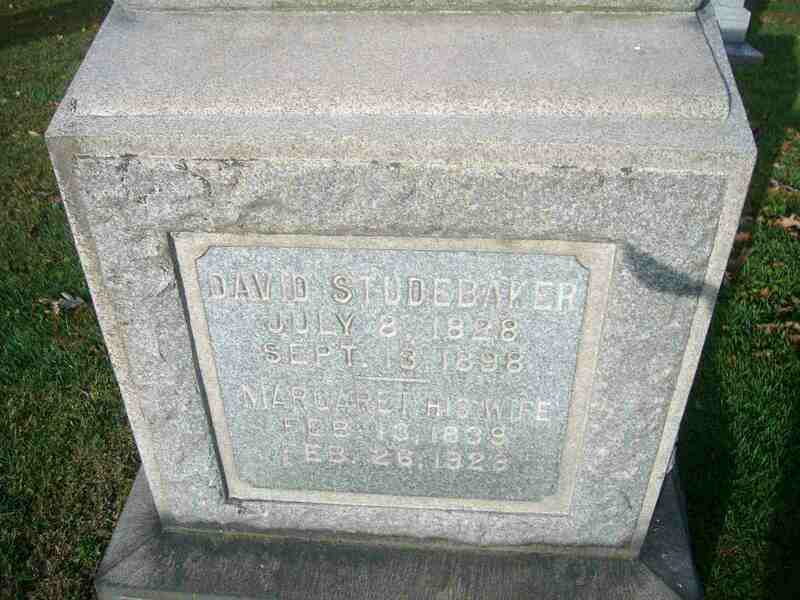 Date of Death listed as 9/20/1862. Stafford, John B 21 dark 5' 6 1/2" hazel dark laborer Mercer Co., Pa. Edinburgh PA Pa. Not found disability; (websmith note: I believe that these two John Staffords are the same person, initially discharged in 1861 after 26 days and then re-enlisting in 1864--however, this needs to be confirmed). Stanger, Isaac N. A 21 student Pike Run, Wash. Co. New York NY 1-Apr-1911 Philadelphia PA not found Per ACWRD, after war lived in New York, discharged 3-14-1862 for promotion to QM Sgt. Steen, Samuel P. K 21 May 30, 1864 Washington DC not found On 10/17/1861 he mustered into "K" Co.
Steinbach, Paul G 21 not found On 8/31/1861 he mustered into "G" Co.
Stephenson, Geo. N. A 19 Brownsville, Pa. 1884 not found On 2/21/1862 he mustered into "A" Co.
(date and method of discharge not given); death year per ACWRD. "John" No further record per ACWRD. Stephenson, Jas. 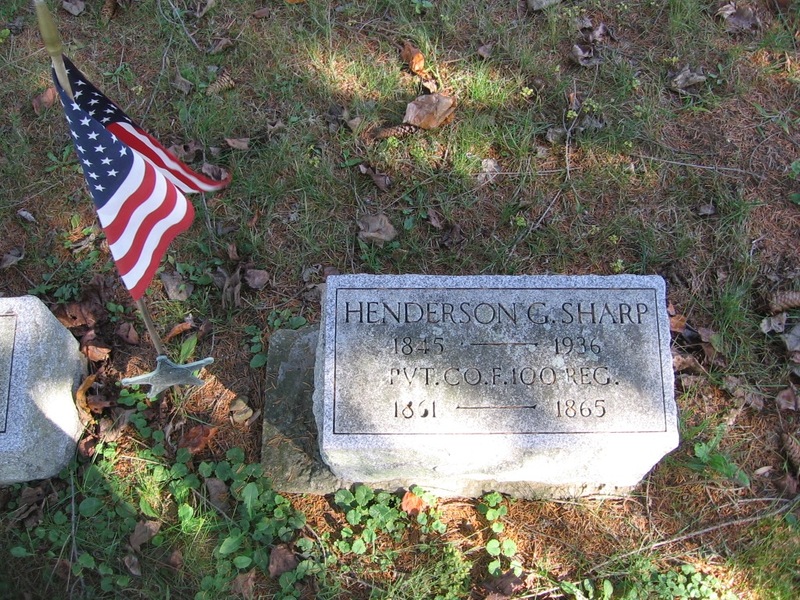 A. K 48 Washington Co. PA Dec 15, 1815 1885 not found On 8/31/1861 he mustered into "K" Co.
Stephenson, Wm. D 24 1838 March 1868 Elk Co. Ridgeway PA X 61642485 Per findagrave, 1868 death date matches pension card info, as does death location in Elk Co.; assume it is same individual. Age 30 at death suggests birth in 1838 which closely matches soldiers age at enlistment-24. Stepler, William F 24 Franklin Co., Letterkenny PA 1839 1908 Chambersburg, Franklin Co. PA 89312752 Per ACWRD, 1865 Draftee; middle initial "H". 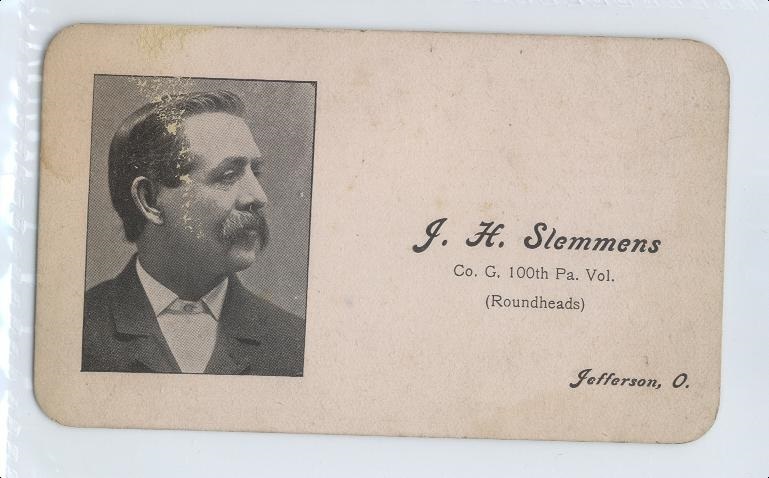 Stevens, Jacob D 33 fair 5' 9" hazel dark farmer Allegheny Co., Pittsburgh PA Columbiana Co., PA Feb 6, 1843 23-Dec-1929 Pittsburgh PA 13327462 Per ACWRD, birth info; also member of GAR post #117 (J.B. McPherson) from Pittsburgh; 1865 Substitute. Stewart, Calvin C 20 florid 5' 3 1/2" teacher Penna. March 1, 1865 Washington DC not found Listed as first initial "J". Middle name Calvin. Stickle, William F 26 dark 5' 3" blue brown wagon maker July 2, 1864 Annapolis X 43209831 On 2/29/1864 he mustered into "F" Co.
Died of wounds rec in action; findagrave info appears to be likely match--listed as July 12, 1864 deathdate. Stork, William A not found Wounded 3-27-1865; no other information found. Buried: Greenwood Cemetery, New Castle, PA; First name "Oscar"
Swam, Francis G 44 Aug 18, 1899 not found On 9/19/1864 he was drafted into "G" Co.; he was discharged on 5/30/1865; lastt name "Swank"? Sweitzer, Charles D 56 not found 1865 Substitute; no other information available. Sweitzer, Daniel C 24 not found 1863 Draftee--no other information found in ACWRD. Swisher, Hiram M 38 July 7, 1829 27-Aug-1906 Franklin Co. PA X 28860717 On 2/22/1865 he was drafted into "M" Co. ; He was Mustered Out on 7/24/1865; also served with 158th Pennsylvania Volunteers.